Calvin Martinez is our favorite ringmaker because of his unique designs and the exacting workmanship that he brings to the fine details of his rings. No two of his rings are exactly alike and the stones he uses in his pieces are of fine quality and particularly well cut. 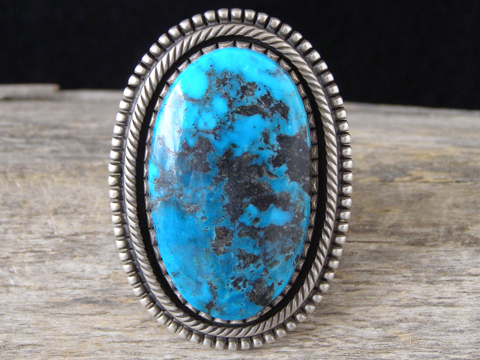 This ring is set with an over-sized oval stone of rich blue natural, untreated Ithaca Peak turquoise from Arizona. Ithaca Peak is one of the mines that clusters around the Kingman Turquoise Mine in Arizona (Turquoise Mountain is another such mine next to the Kingman Mine). Ithaca Peak yields the richest, deepest blues and is the most expensive turquoise on a per-carat basis of the three mines which are next to each other. This ring has a hammered ingot shank and the decorative border surrounding the stone is also hammered ingot work. The stone is set in a handmade bezel to finish off the perfect detail of this wholly traditionally-smithed work of art. Pay special attention to the dimensions cited below. This is a big stone and a big ring. Hallmarked C.MTZ inside an arrowhead and stamped Navajo and Sterling. Stone: 1 11/16" x 1"
Ring face: 2" x 1 3/8"